An international team of climbers has scaled Everest by retracing the steps of two British men who disappeared just short of the summit in 1924. The team says its success shows that George Mallory and Andrew Irvine may have been the first to climb the peak. They say that it adds weight to the theory that the pair may have made it to the top in 1924, 29 years before Hillary and Tenzing's historic feat. The climbers wore replica 1920s clothes for all but the last part of the climb. "Early this morning (Thursday) the expedition team removed the ladder which was bolted to the Second Step [a 40m-high, near-vertical rock face], allowing two climbers to free-climb this 100ft rock wall, the last obstacle blocking their route to the summit," a statement released by the Altitude Everest Expedition said. "In this way the climbers confronted the Second Step very much as Mallory and Irvine might have done 83 years ago. 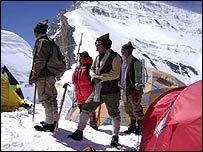 "Their success at the summit, without the use of the ladder, adds weight to the theory that George Mallory and Sandy Irvine may have made it to the summit in 1924, 29 years before Hillary and Tenzing." The team was led by American Conrad Anker and Briton Leo Houlding, who have been on Everest since early May. 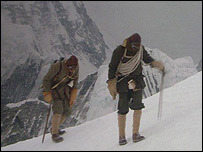 The latter-day mountaineers used replica 1920s clothing until the final ascent, when for health and safety reasons they used modern equipment. They braved the extreme conditions wearing clothes made from wool, silk and cotton. A team spokeswoman told the BBC website that the Second Step is the most dangerous part of the climb. It is so dangerous that permanent ladders have been fixed to the rock to help exhausted climbers. But for this expedition, the team obtained special permission from the Chinese authorities to remove the ladders. This effort is one of the last attempted climbs of Everest before the monsoon rains hit Nepal. A record number of climbers - 514 - have scaled the mountain this year. 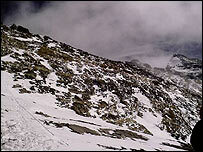 Mallory and Irvine were last sighted a few hundred metres short of the summit before bad weather closed in.